A pair of hand stitched African Kuba textiles, early C20th. 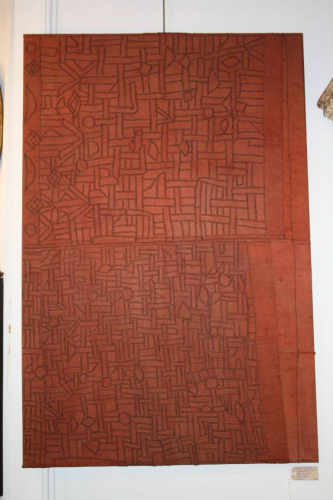 Depicting geometric shapes made using fine black thread hand sown on a terracotta red background cloth. Kuba textiles were unique to the Democratic Republic of Congo formally Zaire and were known for there use of geometric designs and surface decoration. Tho men made the cloth or rafia - it was the women who did all the geometric designs and embroidery. The background cloth of these Kubas have been dyed with twool - a deep red substance made from the heartwood of specific tropical trees and only used in prestige cloths. In Kuba culture twool is believed to have magical and protective properties. Kuba cloths had many purposes including being used for ceremonies, rituals as well as exchanged as currency. These pair have been mounted on stretchers.